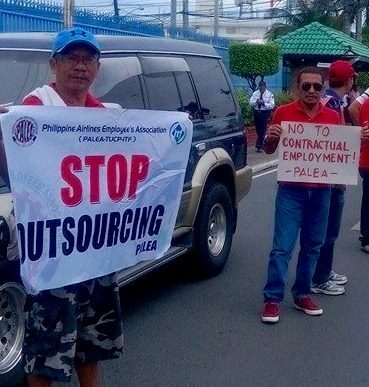 To jumpstart the campaign against endo or contractualization at the Philippines Airlines (PAL), the union Philippine Airlines Employees’ Association (PALEA) picketed the company’s Inflight Center (IFC) near the NAIA Terminal 2. The renewed actions are spurred on by the promise of incoming President Rodrigo Duterte to end endo. Last year, just before Duterte run for president, he met leaders of PALEA in Davao and expressed his opposition to contractualization. PALEA and the militant group Partido Manggagawa (PM) are now asking the President elect to make good on his promise to stop contractualization. Some 100 PALEA members held a rally on the road leading to the Terminal 2 for about one hour and then marched on to the PAL Nichols office to continue the protest until noon. Later in the afternoon, PALEA officers attended at mediation hearing at the National Conciliation and Mediation Board regarding the pending labor dispute with PAL. In September 2011, some 2,600 PAL regular workers were terminated and outsourced to become agency workers. After a two-year fight, PALEA and PAL forged a deal to settle the labor dispute of 2011 yet some 600 retrenched members have not been re-employed as provided for in the agreement. PM also challenged on Duterte to prove that “change is coming” by rectifying the injustice committed by outgoing president Benigno Aquino who approved the PAL outsourcing scheme and later threatened an economic sabotage case against PALEA for launching a protest that paralyzed flights.